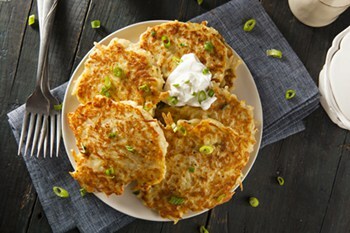 Irish Boxty Potato Pancakes is an Emerald Isle staple and vies with champ and colcannon as a favorite potato dish. It’s often served for breakfast but a can make a tasty side any time of the day. Grate the raw potatoes and add to the cooked and cooled mashed potatoes. Then add the flour and baking soda. Mix well and add enough buttermilk to make a stiff batter. Heat a griddle over medium heat and add the butter. Once melted, drop tablespoons of the batter for small pancakes or spoonfuls (about 1/4 cup) to make large pancakes. Cook about 5 minutes per side or until crispy and golden brown. Serve garnished with sliced scallions, crème fraîche, or even Irish honey, if you can find it.